America is about to meet Andy Enfield all over again. But the Cinderella slipper is gone, replaced by Cardinal and Gold Nikes and a USC Basketball team that went on ESPN and handedly defeated the rival UCLA Bruins 89-75 in Pauley Pavilion on Wednesday night. The debate over whether USC is legit? Gone. Instead, it’s not out of the question to wonder if a high-flying Trojans teams that beat Pac-12 bluebloods Arizona and UCLA in back-to-back contests might have a legitimate horse in the race for the conference’s finest team. 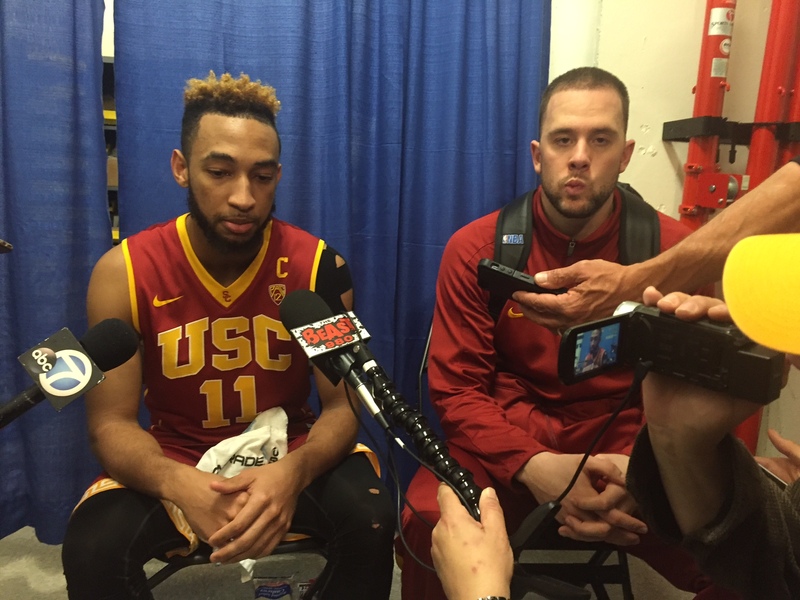 Jordan McLaughlin (left) led the Trojans with 23 points on Wednesday. The Trojans’ four-overtime thriller over Arizona raised eyebrows, but their 14-point victory Wednesday night was the team’s finest win of the season. After letting double-digit second half leads crumble in every Pac-12 matchup, the Trojans matched UCLA at every turn down the stretch. Every time UCLA’s Tony Parker (27 points) scored in the post or the Bruins’ Thomas Welsh (16 points) hit a short jumper, the Trojans, almost without fail, had a quick response. Maybe it was Julian Jacobs flying past the Bruin defense for a slam when UCLA cut it to 10 with 14:09 left. Or Jordan McLaughlin drilling a three on a beautiful wrap-around Jacobs pass after a Parker layup to cut it to 11 with just under eight minutes left. Or freshman sensation Chimezie Metu, a 45.5 percent free throw shooter coming in, hitting three of four in the final three minutes to spoil UCLA’s Hack-A-Metu attempts. The beauty of the Trojans is that the offense never becomes a one-man show. For a team averaging 84.5 points, there’s always someone stepping up. Tonight it was Metu, who notched a career-high 21 points on 8-of-10 shooting and whose 14 first-half points pushed the Trojans to an 48-30 halftime lead. Against Arizona, it was Elijah Stewart’s 27 points that had the Trojans fighting blow-for-blow with the seventh-ranked Wildcats. In the Pac-12 opener against Washington State, Nikola Jovanovic’s 20-12 night pushed the Trojans ahead in Pullman. This Trojan team is greater than the sum of its parts, which allows the squad to survive a 1-of-6 night from freshman stretch forward Bennie Boatwright or a low-key 8-and-6 evening from Jovanovic. The Trojans have five of the Pac-12’s 30 leading scorers, a strong turn from the Byron Wesley-led team that marked Enfield’s 11-21 debut back in 2013-14. Another striking aspect of these Trojans is that the only ones not excited about the team’s success is the squad itself. “We expected to come in here and win,” junior forward Darion Clark reiterated after taking down the Bruins, and his sentiment is echoed across the team. While their playing style pushes the Trojans up and down the court like their pants on are fire, the team’s emotional state remains static. The season is still young, but any doubt whether the Trojans can compete with any team the Pac-12 has to offer has been erased. USC has hit 19 more threes than the Pac-12’s second-best team (Colorado). They’re second in assist-to-turnover ratio. They have a three-man bench that provides athleticism and shot-blocking (Metu), rebounding (Clark), and a three-point weapon (Stewart). The Trojans finally have a well-rounded team with the talent to match any squad in the Pac-12. After earning fame for taking down a pair of perennial powers, Enfield has finally flipped the script. For the first time since 2011, the Trojans are about to be playing the role of favorites. Can they handle that pressure better than that other sport that plays at the Coliseum? Well, that’s this season’s next question to be answered. Easily Arizona ….. Without the win over Arizona the Trojans may not have had the team confidence to win at Pauley .